Our inaugural review goes to Blessed Nation Ranch. Blessed Nation Ranch is a 10 acre farm that features pasture-raised beef and pork, and free-range chickens and their eggs. They don’t regularly use antibiotics (sometimes antibiotics are necessary when a cow is sick, just like with humans – but antibiotics shouldn’t be used like humans use steroids – to grow unnaturally), and they don’t vaccinate. They also sell things like jelly and jam and I’m sure a variety of other things as it’s in season or available. Here’s a good story, written by Janelle, about how they got started on their ranch. I originally contacted Blessed Nation Ranch to purchase half of a pig. Last year I purchased my first part of a cow (I did 1/8th of a cow plus bones and organ meats – yes, I’m an organ meat girl, I’ll write more about that another time, if anyone’s interested). Having part of a cow was so convenient. 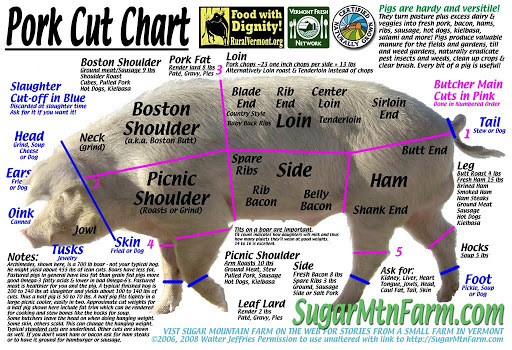 I always had pastured/grass-fed/grass-finished meat in my freezer. And when I first got grass-fed meat, I craved it. It tasted rich to me, almost like butter. But the meat wasn’t fatty. My sister said it didn’t taste any different to her, though. So I’m sure it was me or my brain or my body. Anyway, I ate beef in some form several meals a day for the first several week. I couldn’t get enough! My body must have been deficient in something because I felt great. I’ve read some people who have gone paleo who eat and eat and eat protein the first few months or year of their transition. Then they suddenly start eating less and feel just as satisfied. Many people also conclude the body makes the transition and starts to better absorb nutrients. But until then craves it and needs it. No matter why, that’s exactly what happened for me, and I was a believer! I decided I’d love to fill my freezer with pastured meats raised humanely (or whatever the animal word for humane is). Not because I’m a member of PETA or even much of an animal’s rights activist. Rather, I believed animals raised with love, in lower stress environments and without all of the attempts to fatten them up with grains or antibiotics or other unnatural approaches, would produce healthier meat. Long, rambling story short, back to the original reason I messaged Blessed Nation Ranch: to find out what my options were with a half a pig. Janelle sent me this picture of a pig. Admittedly, it was a little over my head. But, I also knew I wanted to try to cure my own bacon and brine my own ham, so I asked about that. She explained the meat is passed off to the butcher, and each customer walks through the processing. So you can process without curing hams or bacon. Or without paying to have them make sausage, if you so choose. Plus, then I can have them cut the shoulder into steaks for my St. Louis style BBQ steaks! I never knew life could get so customizable! Pigs don’t go to the butcher until August, but I have put a deposit on a half pig, so I’ll review that then. I also purchased some ground beef ($3.50 per pound!). And my sister bought some soup bones ($1.15 per pound!). She also bought some blueberry jam (half pint for $4). I picked everything up on Friday. Friday night my sister made beef broth (broth/stock recipe to come), and then made beef noodle soup with some of it. It. Was. So. Good! Mostly because she’s such a good cook, of course. But I’ve used commercial beef bones before, and I swear the bones of pastured cows produce better stock/broth. She used her soup bones, a few of my beef bones (bones I purchased with my part of the cow from another farm – so bones without meat), vegetables (celery, carrots, onions and garlic), salt, pepper, turmeric and apple cider vinegar (to pull more nutrients from the bones). I put a pound of my hamburger in the fridge Friday night and used it to make ground beef and vegetables (a generic dish I make usually once a week – for some reason I like ground beef and veggies for breakfast), and it was delicious. I like how the meat has the flavor of fattier meats, but really doesn’t put off much fat. Like the best of both worlds! Kristy said it tastes like blueberry pie. I agree. And generally think it tastes like delicious. I am not ashamed to admit I’ve eaten some of it with a spoon. I like jam because it’s chunky, in a good way! At one point I stopped eating jelly because I was counting calories. Instead, if I craved jelly, I would mash up blueberries and/or strawberries in a bowl and spread it on peanut butter toast. Now I’m living on the theory that if it’s fresh, it’s healthier than something else sweet, like boxed cookies or whatever. So I’m back to eating fruit fairly liberally. And jam is one of them. 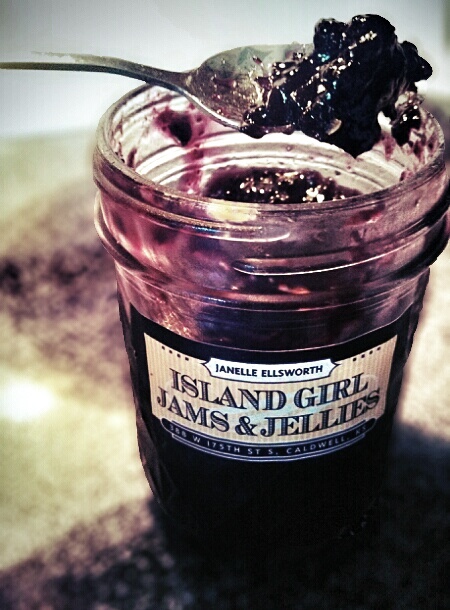 When it comes to jam, especially good jam, I morph into Joey Tribbiani. So, overall, Blessed Nation Ranch – you should check it out! I believe you can buy ground beef, roasts and steaks separately from buying a portion of a cow. They have eggs from free-range chickens. And jam so delicious you will want to hide it in the back of the fridge. And when available, they have good quality beef, pork and I believe chickens. All at affordable prices. And with delivery. Everybody wins! Well, mostly I just win. Because I live alone. And I don’t share food. Have you bought from Blessed Nation Ranch? If so, tell us your experience! One place I like to go to find local farmers is Eat Wild. But there are lots of places you can find good farms. If you know a good site, post in the comments. If you know of a good farm or place to get fresh, local food, post in the comments.